Could Our “Rich Port” Be the First Falling Domino of Financial Doomsday? 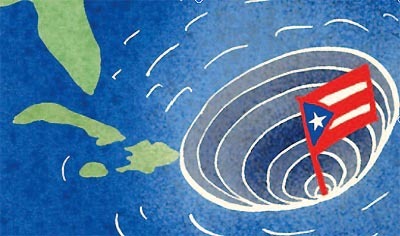 On Sunday, May 1, America's Caribbean island Puerto Rico defaulted on a debt payment of $422 Million. This island that Spanish explorers named “rich port,” Puerto Rico, is roughly the size of Connecticut and is home to 3.5 million U.S. citizens. How has it run up a staggering total debt of more than $72 Billion, more than any U.S. state except New York and California? Monetary expert Craig R. Smith and veteran think tank futurist Lowell Ponte warned of severe Puerto Rican bond debt problems in their 2013 book The Great Withdrawal. In their latest of six books, We Have Seen The Future and It Looks Like Baltimore, Smith and Ponte explain what has gone wrong in Puerto Rico, which could become America's 51st State. Puerto Rico, they write, has been turned into a cash-short poor port by U.S. economic manipulation along with welfare and government pension politics. But in 1996 Washington began a 10-year phase-out of these pharmaceutical company tax breaks. By 2006 the island was suffering economic withdrawal symptoms. Washington allowed Puerto Rico to issue bonds that were triple tax deductible – federal, state and local – across the U.S. Investors were confident because payment on bonds was guaranteed by Puerto Rico's Constitution, and because of the belief that Uncle Sam would in crisis bail out bondholder creditors. These mere pieces of paper sold like hotcakes. The day of reckoning for all this debt may have arrived on May Day 2016....and might set a troubling political precedent for other profligate, cash-short places like Chicago to seek bailouts, warn Smith and Ponte. In Puerto Rico roughly 60 percent of the population is on some kind of welfare, which pays about as much as working. As U.S. citizens, Puerto Ricans are entitled to the same free goodies as other Americans – but are not required to pay federal income tax. By some estimates about half the population evades local taxes. Yes, it resembles Greece. The cash-starved Puerto Rican government now faces not only $72 Billion in debt, but also at least $43 Billion in unfunded government pension obligations. The island's own people and credit unions are major holders of Puerto Rican bonds on which the politicians are trying to renege. In effect, the politicians are trying to shift the cost of political profligacy onto savers who trusted their government. And on July 1, Puerto Rico will owe another $2 Billion interest payment to its creditors. Puerto Rican politicians have tried to squeeze more revenue out of companies and residents. Walmart Puerto Rico was the target of a tax aimed solely at this one company, a tax so heavy that it would devour 100 percent of Walmart profits. A federal judge this March in San Juan struck the tax down, agreeing with Walmart that Puerto Rico is so close to insolvency that its government cannot be trusted even to pay an owed tax refund. Such high-handed taxes face another hurdle. As American citizens, Puerto Ricans have the legal option simply to move to the United States – which is what its youngest, brightest, and most successful have been doing at an increasing rate. Governor Alejandro Garcia Padilla is a member of the Popular Democratic Party, many of whose founders in 1938 were self-described socialists. The party's slogan – “Bread, Land, Freedom” – was adopted directly from the Puerto Rican Communist Party. The party advocates a redistributionist, economic democracy ideology roughly like European welfare states. It is closely aligned with the Democratic Party in the United States. The Governor also made clear on May Day that he wants ample American taxpayer money from Washington to bail out his economic mess – but he does not want federal oversight that monitors and controls how he and his party spend the money. “The Congress has thus far been slow to bail out a free-spending government in Puerto Rico,” say Smith and Ponte. “In the past, Washington's tinkering with this island's economy created an artificial prosperity based on tax breaks, then created very real addiction and dependence that got many hooked on a costly welfare state,” say Smith and Ponte. “Before Congress rushes in to keep bad policies in place, we need to help Puerto Rico move towards free enterprise, small government, and self-sufficiency,” they say. For a fascinating media interview with Craig R. Smith or Lowell Ponte, contact: Bronwin Barilla at 800-950-2428 or email bkbarilla@dontbankonitbook.com. Craig R. Smith and Lowell Ponte, We Have Seen The Future and It Looks Like Baltimore: American Dream vs. Progressive Dream. Phoenix: P2 Press, 2015. For their discussion of Puerto Rico, see pages 200-202. 3.21.16 - Phoenix, Arizona - Swiss America Trading Corporation, a Phoenix based private investment firm that specializes in the security, wealth protection, and profit potential of precious metals; has just released The 2016 Gold Report: Global Edition. The 2016 Gold Report is a topical examination of the world's risk-ridden global economies and gold's resurging role as an essential store of value. Offering an in-depth exploration of global GDP, negative interest rates, China's slowdown, and the mounting central banking crisis --- the report maintains that 2016 is a pivotal year for diversification and safe haven allocations. "Our new Gold Report highlights the dramatic events that are taking place in international banking, lending and borrowing and their impact on our personal assets," states Dean Heskin, CEO of Swiss America. "Today's marketplace is highly interconnected and the breadth of the current economic crisis underscores the need for global asset protection." The 2016 Gold Report explores a variety of global trouble spots including international stock volatility, the European debt crisis, slumping oil prices, rising capital outflows, and dire GDP forecasts. All of this translates into portfolio vulnerability. The report includes an exclusive "Global Risk Test" which helps gauge financial security in the global marketplace via a simple Q&A about liquidity, diversification, global purchasing power, intrinsic value and other areas highly correlated to economic risk. "It's important to remember that this not your father's investing climate. The financial world is radically different than it was twenty or thirty years ago. We all need a 2016 financial portfolio and nothing makes that more clear than our Global Risk Test," adds Heskin. With the uncertainty of a presidential election, a dovish Fed, increased monetary easing across Europe and Asia, world banks on the brink of meltdown, and ever-growing terror threats ---- 2016 is shaping up to be a critical year in investing. The new report underscores how gold has become one of the biggest winners of the year and its importance as a tangible alternative to all those wealth-tapping market events that often happen half a world away and well beyond our control. 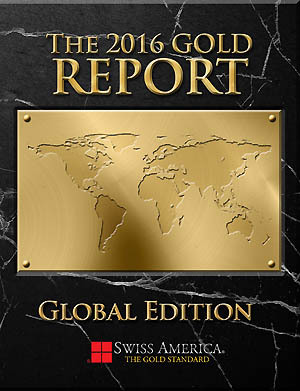 The 2016 Gold Report is a complimentary publication from Swiss America and is part of the company's ongoing commitment to help investors make informed decisions to keep their money safe in a dramatically changing and volatile world. The report is available via an Instant Download at www.2016GoldReport.com or by calling Swiss America directly at: 1-800-289-2646. 3.2.16 - Swiss America Trading Corporation, a Phoenix based private investment firm that specializes in the security, wealth protection, and profit potential of precious metals; has just released its 2016 World Money Report. 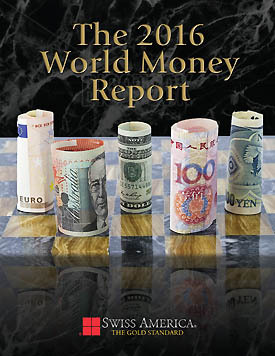 Swiss America's new 2016 World Money Report is an insightful study of economic globalization with particular emphasis on the US dollar's diminishing role as the world's reserve currency. It explores currency manipulation and how paper money is used as a competitive weapon in the world marketplace. "This is an important read for anyone holding dollars in a savings or retirement account," states Dean Heskin, CEO of Swiss America. "It underscores the changing climate of global money and what that means for the average investor." The 2016 World Money Report surveys the volatile euro, the rising yuan, as well as the global ambitions of China, Russia and Iran in abandoning the US dollar in bilateral trade. This, along with overtures from both the UN and the IMF, suggests that an entirely new reserve system may soon be on the horizon. "New geopolitical forces are changing how the world does business and investors need to prepare for a post-dollar era," adds Heskin. In a time of increasing economic integration, the consequences of growing multi-national interdependence with respect to trade, capital, and currency are dramatically altering the investment landscape. This new report offers important insights on the evolving new world order and the fiscal impact on Wall Street, the Fed, the dollar, lending, manufacturing, and banking. The eye-opening study also exposes America's squandered privilege as decades of out of control spending, costly wars, hefty entitlement programs, and loose monetary policy have eroded confidence in US currency and American fiscal leadership. The 2016 World Money Report is a complimentary publication from Swiss America and part of its ongoing commitment to help investors make informed decisions to keep their money safe in a changing world. 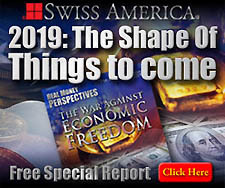 The report is available online at http://www.2016MoneyReport.com or by calling Swiss America directly at: 1-800-289-2646.